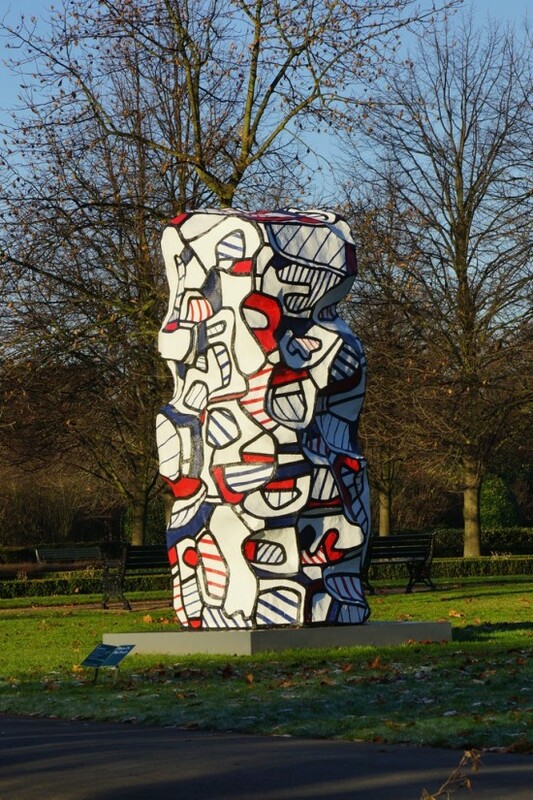 Jean Dubuffet in the Rijksmuseum Gardens is the fifth in a series of five open-air exhibitions in the gardens. The sculptures have been selected to represent the theme of Dubuffet’s work, namely man amongst culture and nature. Sculptures with human figures are strongly represented in the exhibition, with both single and grouped figures. The monumental, almost five metres high Arbre biplan from Lisbon and Waddington Custot's four metres high Tour aux Récits, represent nature (the tree) and culture (architecture), respectively. These two sculptures flank the bicycle passage at the Stadhouderskade. In the Atrium of the Rijksmuseum, visitors can sit on a bench (Banc Salon) with a number of Cerfs volantes (Kites) hovering above. All sculptures in the exhibition date from 1968 and later. Many of the monumental sculptures have never before been on display in the Netherlands. Simultaneously with the exhibition at the Rijksmuseum, the Stedelijk Museum in Amsterdam is presenting a selection of its own extensive collection of Dubuffet’s art: Jean Dubuffet: The Deep End assembled by guest curator Sophie Berrebi (Art History professor at the University of Amsterdam).